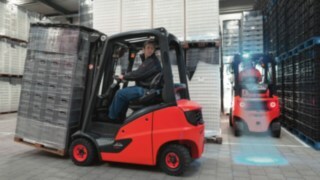 Forklift and pallet trucks are involved in many internal traffic accidents. So far, pure vehicle safety solutions have not been able to reduce the number of accidents. 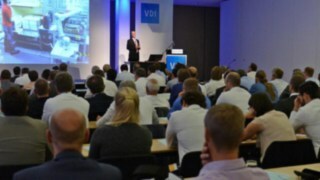 At the German Material Flow Congress of the VDI Knowledge Forum, experts from Linde and Comnovo explained their alternative approach: By interlinking with the environment, industrial trucks recognize dangers even before they arise. The number of serious accidents at work has been decreasing for years, but this trend is not noticeable when working with industrial trucks. 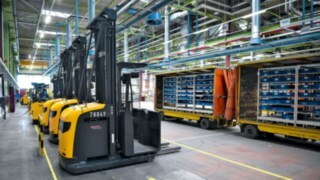 On the contrary: For 2014, the German statutory accident insurance (DGUV) registered 31,064 internal accidents involving forklifts and pallet trucks. In 2016, there were 33,868. 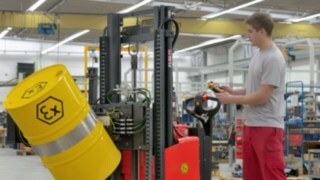 In 65 percent of cases, forklifts collide with shelves, run into road limits or hit employees. More than half of all accidents occur behind the stationary vehicle. 55 percent of all collision accidents happen while reversing. Anyone who knows everyday intralogistics understands such figures. Growing flows of goods demand ever more complex processes from companies, which keep the risk of accidents constantly high. Therefore, assistance systems should help to avoid accidents. In the event of tipping accidents, for example, restraint systems intervene. 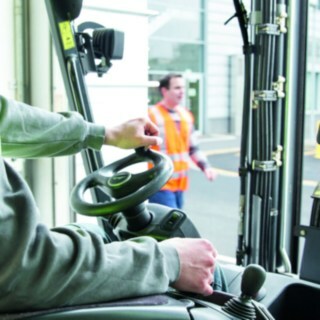 Or driver assistants stabilise the truck so that it does not tip over or collide. These helpers have saved many lives, but only intervene when the danger is already imminent. Dr.-Ing. 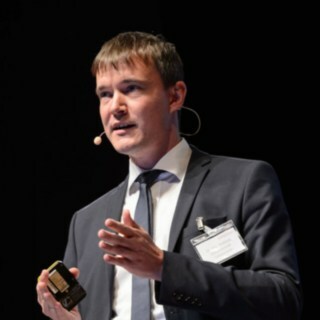 Andreas Lewandowski, Managing Director of the start-up Comnovo, and Alexandra Mertel of Linde Material Handling presented an alternative at the 27th German Material Flow Congress in Garching near Munich. 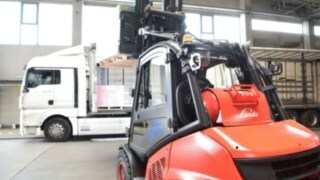 Comnovo has been a subsidiary of Linde Material Handling since 2017 and offers safety assistance systems for industrial trucks. 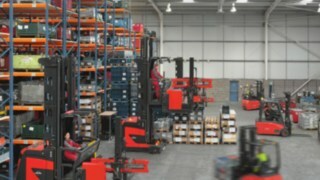 We have been looking for solutions that protect all involved parties and components in intralogistics. 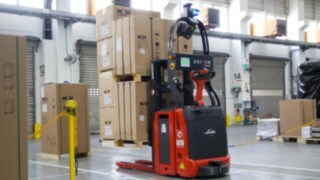 Linde's safety concept links the industrial truck with its surroundings. It can thus detect dangerous situations before they occur. This not only protects the vehicle from damage, but also the environment. 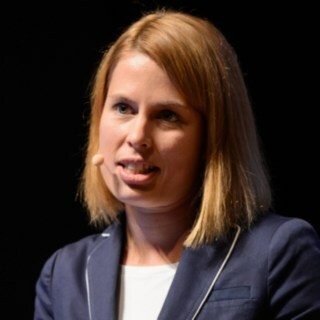 "We have been looking for solutions that protect all involved parties and components in intralogistics," explained Alexandra Mertel. Two approaches emerged from this goal. The first is the Linde Safety Scan, for which Linde consultants analyse sources of danger directly on the customer's premises. They identify danger points and provide recommendations for greater safety. These recommendations also relate to organisational and technical aspects such as footpath marking, safety vests or assistance systems. But knowing the danger spots is only the first step. For its networked safety solution, Comnovo has clustered typical intralogistics risks into four categories: collisions between vehicles and pedestrians, between vehicles and vehicles and between vehicles and infrastructure. In addition, there is excessive speed in danger zones. 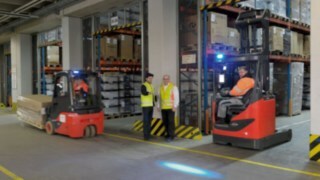 Dangers often arise when forklifts and people work together, as it is not always possible to separate travel and walking routes. In historically grown intralogistics halls there are also many places that are difficult to see. The entrances and exits of halls are also critical. Often a main traffic route passes directly behind it. Industrial trucks often meet people there who were not previously visible. 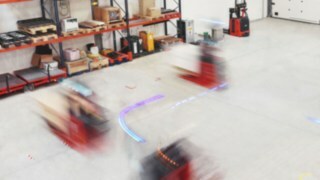 Linde and Comnovo meet such scenarios with their Linde Safety Guard assistance system. With our technology we were able to solve existing problems for many customers. That is why we have now equipped almost a hundred sites with the Safety Guard. The Linde Safety Guard is based on the logic of an early warning system: the truck communicates with the environment by radio and anticipates hazards before they occur. The industrial truck contains a unit that is both transmitter and receiver. It surrounds the vehicle with a safety zone and detects transmitters from persons and objects. If a minimum distance is not kept, the system alerts all parties involved by acoustic and optical signals. The display shows the driver whether the wearer of a passenger unit is in front of or behind him, to the right or left of him. Stationary warning units, for example at the exits of common rooms, can be used to warn people when a vehicle is approaching behind the door. In addition, user-specific zones can be defined in which vehicles are to drive slowly. The Linde Safety Guard is designed in a way that the user can equip any truck with a unit and then, if required, transform other trucks, persons or entire areas into protection zones that warn the approaching vehicle. The size of all protection zones is freely configurable, as is the reaction time of the individual units. 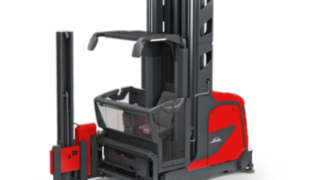 Since the Linde Safety Guard consists of individual components, it can currently be retrofitted to all counterbalanced trucks. "It's no use if only the new vehicles have this assistance system. Retrofitting is really very easy," promises Mertel. 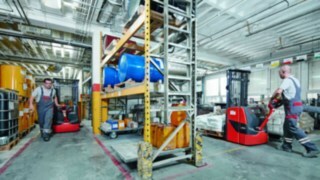 Exact material flow processes for a highly standardized forklift truck and warehouse truck fleet: Sika Deutschland GmbH achieves this with an overall logistics concept which, despite customer-specific solutions, relies on standardization, focuses on a forklift brand, and leases equipment on the basis of full-service leases.